Back in October 2011, I shared a video about stray dogs taking the subways in Moscow. And now just this weekend, a dog in Toronto decided to hop on the GO train and take a trip downtown, by himself! A Scarborough family has been reunited with their pup after he decided to hop on the GO train and take a trip downtown. Dorte Petersen said she had gone for a walk with her dog Marley on a Scarborough path they’re both familiar with on Sunday. She said they had only been home a short time when she got a strange call from a conductor on a GO train. They said, We have your dog and not to worry. The good news is he’s safe and we’re giving him treats but he’s actually headed to Union (Station). He’s missed the boat for getting off at Rouge, Petersen told CTV News Toronto. Somehow the six-year-old Border Collie-Shepherd mix escaped from their home, trotted over to Rouge Hill GO Station and walked onto a westbound train on the Lakeshore East Line. After a nearly two-hour journey, GO Transit employees returned Marley to his family. Metrolinx spokesperson Anne Marie Aikins said it seems Marley misunderstood GO Transit’s new policy that allows leashed dogs on board trains. You’re supposed to have your human with you!! We didn’t charge him for not having his PRESTO card either, Aikins wrote. Aikins added that it is a first for the transit service’s lost and found department. Meanwhile, Petersen is still trying to figure out how the pup got out in the first place. Only Marley knows, she said. What an adventurous dog! I’d love to know what was going through his mind as he rode the train downtown. 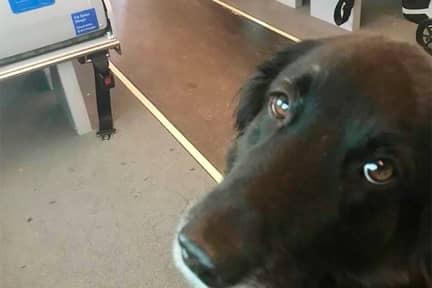 A Dog Took a Ride On the GO Train, By Himself was published by Daniel Menjívar on August 7, 2018 at 10:37:57 PM EDT and last updated on April 18, 2019 at 4:41:28 PM UTC .